Colorized sub-Angstrom scanning transmission electron microscope image clearly shows individual columns of atoms in the brick-and-mortar structure of Ruddlesden-Popper Sr7Ti6O19. Overlaid simulated image shows close agreement between theory and experiment. Layered complex oxides offer an unusually rich materials platform for emergent phenomena through many built-in design knobs such as varied topologies, chemical ordering schemes and geometric tuning of the structure. A multitude of polar phases are predicted to compete in Ruddlesden–Popper An+1BnO3n+1 thin films by tuning layer dimension and strain. 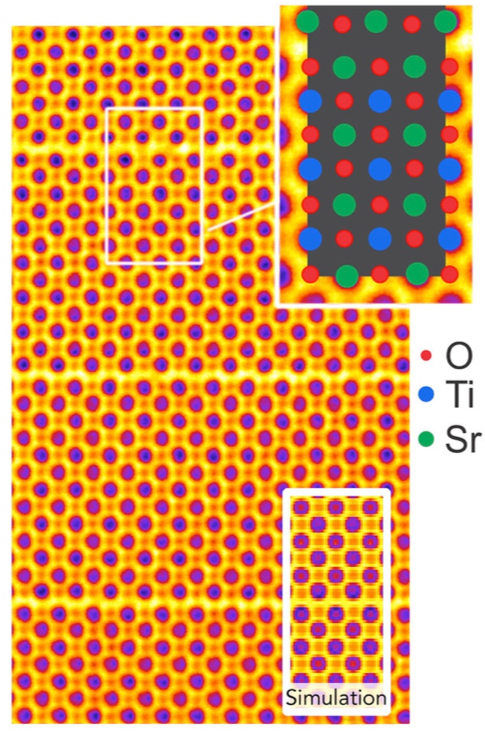 Using aberration-corrected scanning transmission electron microscopy with sub-Ångstrom resolution in Srn+1TinO3n+1 thin films, the IRG team demonstrated the coexistence of antiferroelectric, ferroelectric and new ordered and low-symmetry phases. The atomic rumpling of the rock salt layer, a critical feature in RP structures that is responsible for the competing phases, was directly imaged with exceptional quantitative agreement between electron microscopy and density functional theory down to 5pm (about 1/10th the size of a hydrogen atom). Such sub-atomic metrology can be transformative in bringing theory and experiments together for materials design at large.